At this year's National Sports Collectors Show in Chicago, I met Chris Harris of StaleGum, who passed along five copies of his Jefferson Burdick has a Posse sticker, a great take on Shepard Fairey's street art featuring Andre the Giant. 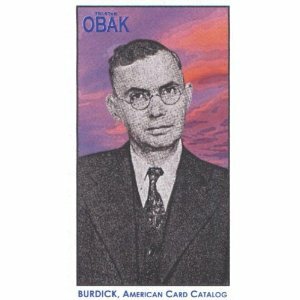 Jefferson Burdick is the best-known early card collector and his American Card Catalog set a base for most of our hobby's organization and practices, such as set numbering, checklisting, and pricing. Tristar immortalized him appropriately (with a modified image) in their 2010 Obak set. Fellow blogger Cardboard Junkie tweaked his own Shepard Fairey-inspired take on Burdick for the post (and image) COLLECT. Check out George's articles for much more, including a visit to Jefferson's original collection at the New York Metropolitan Museum of Art. Thanks to Chris for the Posse sticker, George for talking through Jefferson's history, and Junkie for COLLECT! I enjoyed assembling all of these pieces for other collectors and Burdick fans to find. Friday Giveaway: Your Team's Best Power Trio? What would YOU do to get a #5?